Risks flowing from sustainability are managed in the same way as other business risks. Our company wide risk management model provides a robust foundation for identifying risks and establishing a clear management response. In 2018 we carried out a review of our material sustainability issues. For this process we spoke to shareholders, joint venture partners, non-executive directors and our retailers. We explored what was changing in their sustainability priorities and concerns and the implications they felt this had for our sector and particularly for the business. Each factor was scored on the basis of its current importance for the shareholders and how they expected it to change over the next five years. These scores were combined with the views of the other stakeholders and an internal score reflecting the significance of the issue to company strategy and the ability of the business to influence of control the issue. This analysis produced our priority order of material issues. 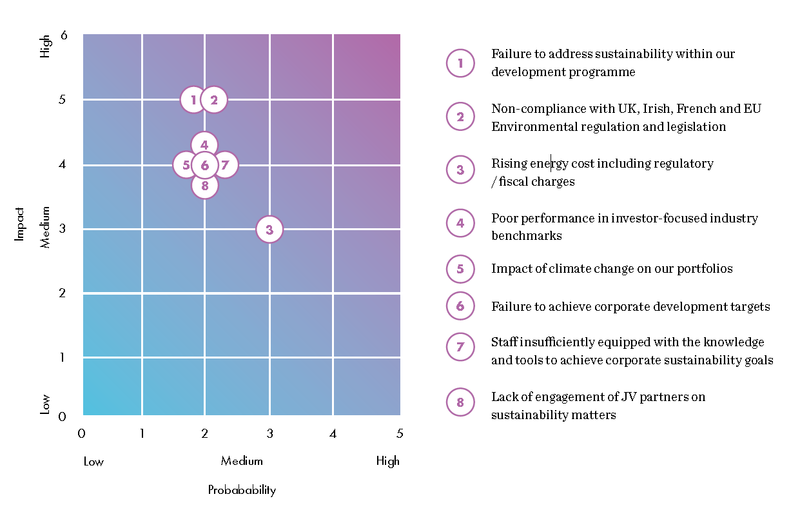 The risk heat map set out below includes the eight sustainability risks we consider to be most significant for the business. The map is based on the probability of the identified risk occurring and the severity of the impact if it does occur. The analysis demonstrates that the eight key sustainability risks are contained within the medium risk area of the map. We consider each of the risk areas as being effectively managed but the business is alert to their importance. Sustainability risks are communicated through the business via our Corporate Responsibility Governance structure. The EU referendum result has produced some uncertainty regarding environmental legislation and regulation originating from the EU. However, most is already transposed into UK law and we do not expect there to be significant change. We will of course be monitoring developments particularly in relation to the Business Energy Tax Review which led to the withdrawal of the CRC Energy Efficiency Scheme. Our assets in France and Ireland remain subject to any existing and future EU Directives and regulations. Our response is to continue monitoring the legislative and regulatory landscape through industry groups and forums. Our Responses to Legislative Risk ensure the business has strategies in place to manage any risk associated with forthcoming and potential legislation.